How to start an app? 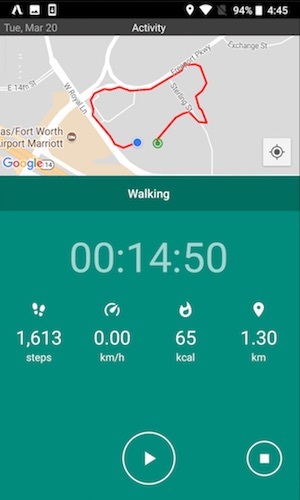 After installing Accupedo app, you just need to walk. The app will do the rest. 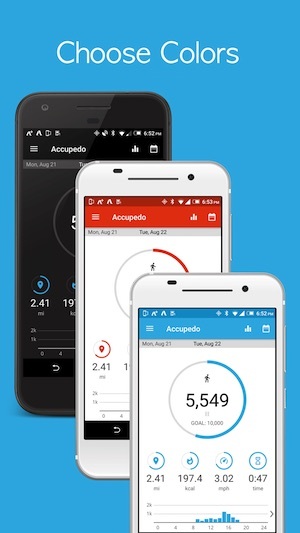 Accupedo will automatically wake up and count your steps when you start to walk, and will go to sleep while your phone is at still to minimize a battery. ***Accupedo may not work for a few phones when phone is at standby (screen is off). In this case, we recommend you to try Google Fit or built-in step count method. Also, please check Troubleshooting. • Pause / resume: You can pause or resume step counts anytime. 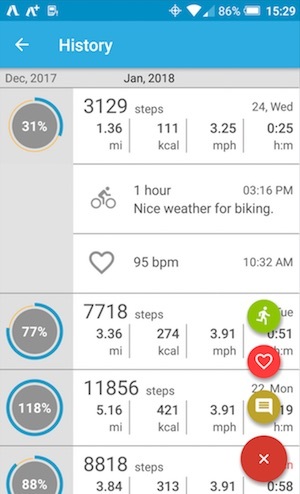 This button is located at the below of step counts at the main screen. Tap a pause / resume button (or step count number), then it will pause. You need to tap again to resume. There are three sensing methods: Accupedo, Google Fit, and built-in step counter. Go to Settings window and choose your preferred method. Initial setting is a built-in step counter method. • Accupedo: This method uses phone's internal acceleration sensor (G-sensor) to calculate step counts. At this method, you can configure more parameters including power usage mode, sensitivity, smart filter, and consecutive steps. 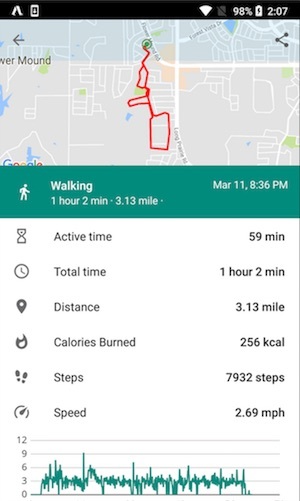 • Google Fit: This method reads data from Google Fit. Step counting is not real-time, so there will be some time delay. Your data will be stored at Google Fit. It requires an additional location permission and Wi-Fi (or mobile network). 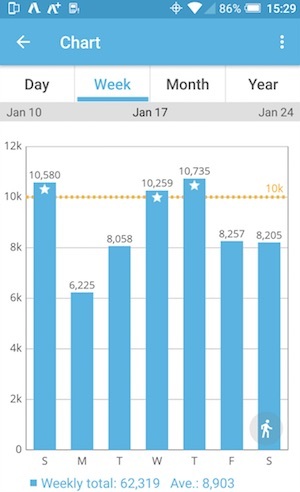 • Built-in step counter: This method reads data from a built-in step counter of Android phone. It may count your steps more reliably without consuming battery. This option may not be available for some phones. Main window displays today's data and progress including step counts, distance, calories burned, speed, and active time. • Navigation: Menu icon ( ☰ ), Chart, and History icons are on top of the main window. • Previous day's data: Swipe the screen from left to right to see previous day's data. • GPS activity tracking with map: Swipe the screen to right to start activity tracking. 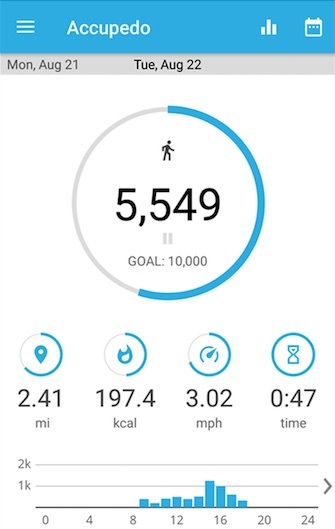 You can track your activities (walking, running, and biking) with map. From the main window, swipe the screen to right, then activity tracking window will show up. GPS signal will be used to track your location. You need to allow location permission. GPS consumes battery, so you need to stop it after finishing GPS activity. • Start: Open Accupedo, touch the screen and swipe to the right. Activity window will show up. Choose one of the activities (walking, running, and biking), and click 'Start' button. You need to give a location permission. • Activity report: After activity finishes, click 'Stop' button and then click 'Save' button at the right side to finish and save the activity. The activity report will be added at the History window. Chart window displays daily, weekly, monthly, and yearly chart. • Display mode: Click a display mode icon (circular icon) at the right bottom of the window. You can select from step counts, distance, calories burned, and active time. • Swiping: Swipe the screen to left to see previous day's data. History window displays the daily log of current month. • Adding Activity, Heart rate, and Memo: Click the red plus icon at the right bottom of the window. You can add various fitness and sport activities, heart rate and memo. • Edit or delete activity: In order to edit or delete an activity, heart rate or memo, press and hold a specific item. A dialog box will pop up to edit or delete each item. • Swiping: Swipe the screen to right to see previous data. You can share your daily log to social media, email, message, etc. Choose any date from date picker, and click the Share icon on the right top of the window. You need to give a permission to allow to access photos, media, and files on your device. Four sizes of widgets (1x1, 2x1, 3x1, and 4x1) are available. In order to select widget color, go to Settings > Design & Display > Widget skin color. Seven colors (dark gray, black, blue, green, orange, pink, and transparent) are available. Please follow the instructions below. 1. Press and hold your finger on your Home scree. After holding for a second, a menu will pop up at the bottom of the screen. 2. Select the 'Widgets' option on that menu. 3. Scroll down until you reach Accupedo widget. 4. Select and hold one of the Accupedo widgets, drag and place on to the empty space of the Home screen. Please do not install Accupedo at SD-Card. Widget cannot be opened at SD-Card. If you cannot find Accupedo widget, reboot your phone, and then find Accupedo widget again. Smart messages and daily quotes will be displayed to encourage more walking. This feature is initially disabled. Go to Settings > Notification, and enable this option. This feature is available only for some countries. There are two options: Google Drive and Phone. We suggest you to use Google Drive backup option. During the backup, you need to give a permission to read and write the file. If you have not during backup, please go to phone's Settings app > Applications > Accupedo > Permissions. Then, enable Storage. 1. From an old phone, open Accupedo, click Menu icon ( ☰ ) > Backup > Google Drive. 3. From a new phone, open Accupedo, click Menu icon ( ☰ ) > Backup > Google Drive. 5. Go to Accupedo History or Chart window to check if your data is imported. 1. From an old phone, open Accupedo, click Menu icon ( ☰ ) > Backup > Phone. 2. Click Export button. It will backup a database file (Accupedo.db) to Accupedo folder in your old phone memory. 3. Go to Accupedo folder, email the Accupedo.db to your email. You can use a file manager or similar app to go to Accupedo folder. 5. From a new phone, open Accupedo, click Menu icon ( ☰ ) > Backup > Phone. 6. At Backup widow, click Import button. It will import a database file (Accupedo.db) from Accupedo folder. 7. Go to History or Chart window to check if your data is imported. 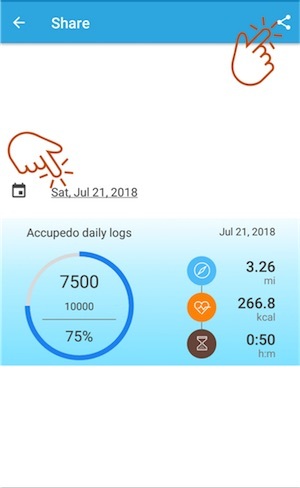 You can edit or reset step counts of today and previous days. • Today: Open Accupedo, click Menu icon ( ☰ ) > Edit Steps. You can edit or reset step counts. After editing, you need to click 'Confirm' button. • Previous days: Open Accupedo, go to History window, and press and hold a specific day that you want to edit. 'Edit Steps' window will show up, and you can edit or reset step counts. Open Accupedo, click Menu icon ( ☰ ), select Settings, and you can configure an app. • Sensing method: This setting is explained at the above. • Design & Display: You can select theme colors, widget color, animation time, first day of the week, and more. Three themes: light blue, dark blue, and light orange, are available. • Unit: Select Metric or imperial unit. For calorie, kcal and kJ are available. • Personal: Personal information is used to calculate calorie burned and distance more precisely. The measurement of step distance is from toe to toe, or heel to heel. Typically, walking step distance is 75cm (30 inch) for men and 60cm (24 inch) for women. • Goals: Set your daily goals for step counts, distance, calories burned, speed, and active time. • Notification: Enable or disable notifications. Smart messages are daily quotes are available only for some countries. • MyFitnessPal: You can sync step counts with MyFitnessPal. 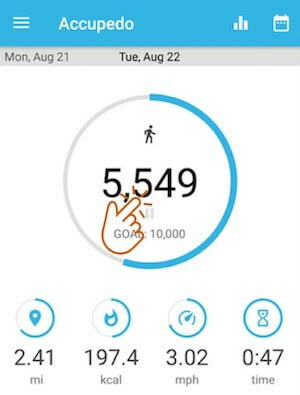 Once connected, step counts will be automatically shared with MyFitnessPal.